By Chris Williams: Trainer Freddie Roach believes that the November 13th match-up between Manny Pacquiao and Antonio Margarito is a saleable fight that the boxing public will want to see. In an article at 8countnews.com, Roach describes the Margarito-Pacquiao fight as “Marketable,”, and says “Manny will knock him out, we will knock him out.” This is the typical prediction for Roach. Roach has predicted knockout wins for Pacquiao in his last four fights and has been right most of the time, with the exception of the Joshua Clottey vs. Pacquiao fight. Roach was also wrong about that fight being an exciting fight. 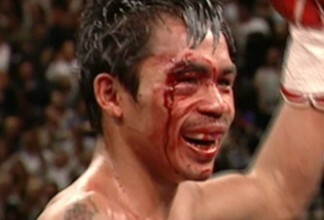 It turned out to be a read dud, one of the least entertaining fights for Pacquiao in ages. Roach is probably correct about Pacquiao stopping Margarito in this fight. If Shane Mosley was able to do it last year, then it stands to reason that Pacquiao should be able to duplicate Mosley’s efforts. However, I don’t necessarily agree with Roach on the Pacquiao vs. Margarito bout being a “Marketable” fight. If Roach means marketable as in bringing in 700,000 pay per view buys, which is what the Pacquiao-Clottey bout brought in last March, then I agree with Roach. But I don’t think 700,000 PPV buys is a very high bar for Pacquiao when Mayweather is bringing in double those numbers at 1.4 million buys. In that case, 700,000 isn’t nearly good enough. It wouldn’t really matter if not for the PPV numbers to be used when it comes down to trying to put together a fight with Floyd Mayweather Jr. in the future. I don’t know that a fight between Pacquiao and Margarito will be marketable enough to break the 1 million PPV mark, which is what Pacquiao badly needs right now to help him for negotiating a fight with Mayweather in the future. Bob Arum, Pacquiao’s promoter, had to have understood the importance of Pacquiao needing a huge saleable fight for his next bout. But I don’t know why, other than the fact that Margarito fights for Arum, that Margarito was chosen for Pacquiao to fight. There’s bigger names out there that the boxing public would like to see rather than Margarito. Some boxing fans feel that the Margarito-Pacquiao bout won’t even make 700,000 PPV buys. If this turns out to be the case, then Arum will need to do some talking with Pacquiao to make him understand that he’s probably going to have to accept less than a 50-50 deal with Mayweather next year if he wants to fight him. Of course, Roach, being the genius that he is, could be right about the Pacquiao-Margarito fight being marketable. The fight could end up bringing in 1 million + PPV buys. That would put Pacquiao in a great position to demand a 50-50 deal with Mayweather next May. I kind of doubt that will happen, but it’s possible. What’s working against that happening is couple of things: First of all, Margarito was stopped last year by Shane Mosley in a 9th round stoppage. Before that fight, Margarito’s hand wraps were discovered to have a plaster-like material inside of them. This led to Margarito having his boxing license revoked by the California Athletic Commission for one year. Margarito still doesn’t have his boxing license back. But worse, a lot of boxing fans now question many of Margarito’s previous victories and wonder whether he was fighting with plaster in his hand wraps even then. It’s sad that his once incident is tainting much of Margarito’s career with some fans. However, it may not matter, because the Pacquiao-Margarito fight will be marketed to the casual boxing fans and they won’t know much about Margarito’s prior history when it comes time for them to purchase the Pacquiao-Margarito fight. Tererence Crawford: Who’s next for him?